A spicy avocado quinoa stack is simple to make, and can be a quick healthy dinner or fancy appetizer that will impress your guests. Vegetarian, dairy-free, and gluten-free. We had a really busy weekend! My dad’s birthday was on Saturday, and Sunday was Father’s day. Needless to say, we had a lot of special family time this weekend! It was filled with eating lots of delicious food, watching old family videos and just hanging out together. I hope you got to spend time with your loved ones this weekend too. This spicy avocado quinoa stack was created out of my lack of time to cook this last week. I had a big bowl of Travis’ favorite cilantro lime bean salad in the fridge that I had prepped earlier this week. I wanted to stretch it into a few different meals, so I had to get creative. A spicy avocado quinoa stack is simple to make and can be a quick healthy dinner or fancy appetizer that will impress your guests. Vegan and gluten-free. Combine olive oil, agave, lime juice, garlic, cayenne, paprika, & cumin in a small bowl. Stir to combine. 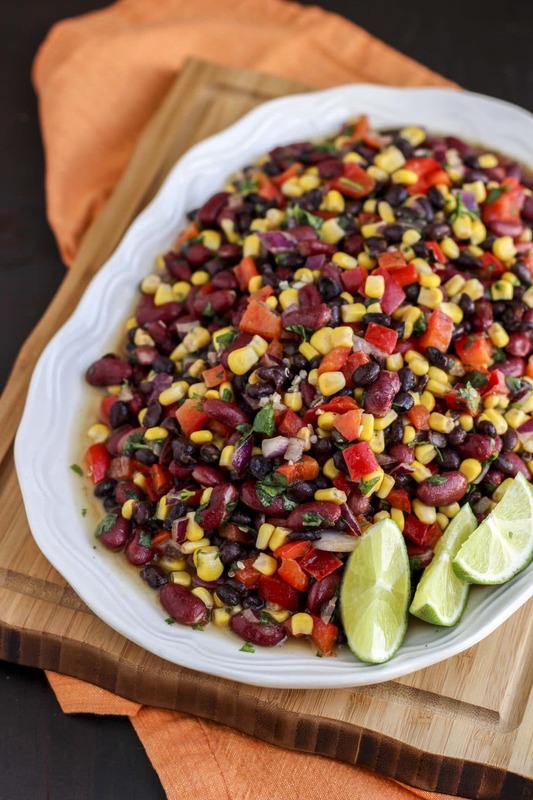 Add beans, corn, peppers, onion & roughly chopped cilantro to a large bowl. Pour the dressing over the top. Mix to combine and season with salt and pepper. Put the bean salad in the fridge for 2-3 hours to let the flavors meld. Note – The portion size for the cilantro lime bean salad recipe is not the amount I make just for the avocado quinoa stack. I make a large batch so we can eat it for a few meals. 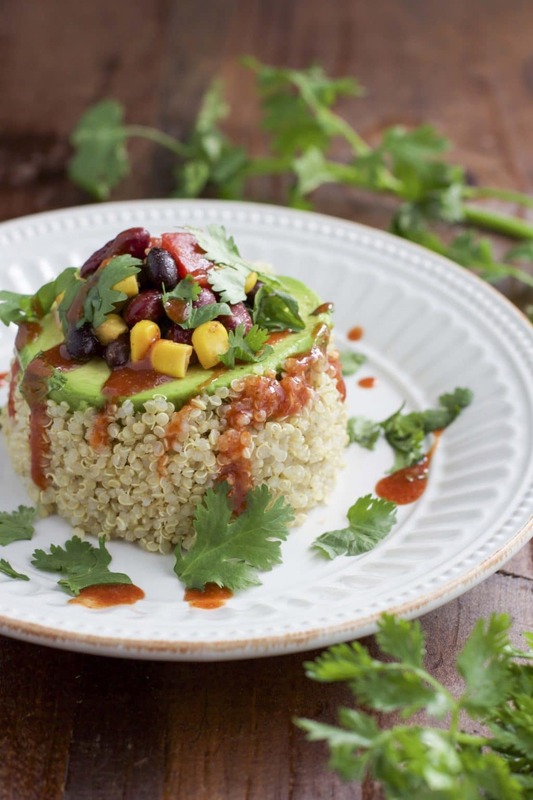 You only need 1/2 cup of the bean salad for the avocado quinoa stack recipe. I also serve it as a side dish with sweet potato burgers, I mix it with quinoa and put it over salad to make southwest quinoa salad bowls, or as salsa with chips. It’s very versatile! I always keep a bag of Costco avocados on hand, and avocado go perfectly with this bean salad so it was a no-brainer to use them. Hey, avocado lovers! I’ve got a few tips for you! Do you ever find yourself trying to use up all your avocados before they get too mushy? I’ve found that if I leave my avocados out on the counter until they’re the perfect slightly softened consistency and then put them all in the fridge, they will stay like that for the whole week! I only take them out when right before I’m ready to eat them! The cold air helps to slow down the ripening process! Also, if you find yourself with way too many avocados to eat within a week or so, you can let them ripen, cut them in half and remove the pit and freeze them! It really works! Just don’t freeze the whole avocado or freeze them while they’re still hard because they won’t ripen any more once defrosted. After I had already decided on calling them “stacks,” my mom told me that they’re actually called timbales. I don’t think I’m ever going to remember to call them that, so I’m going to stick with stacks for now. 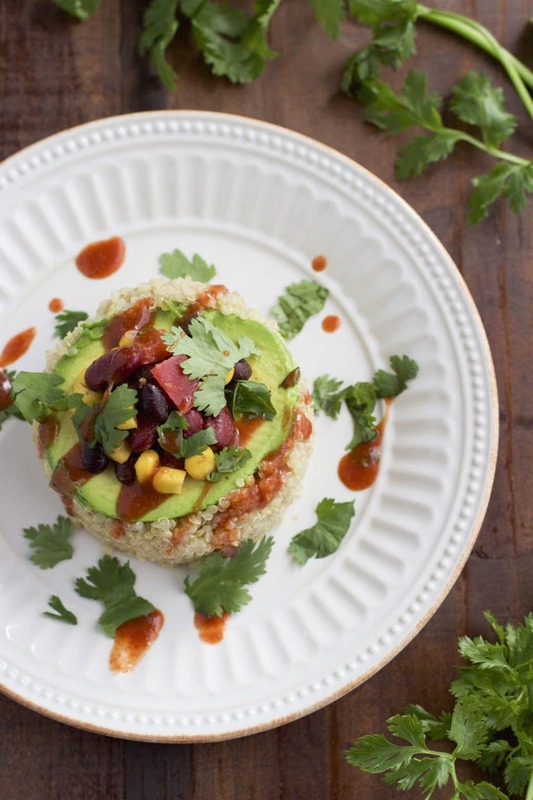 If you’re having a fancy dinner, then you should definitely call them spicy avocado quinoa timbales! I used my 1 cup measuring cup to form the avocado quinoa stack. It’s the perfect size for a light dinner or appetizer. Cut the avocado in half and put it flat side down into the bottom of the measuring cup. Then lightly pack the quinoa in on top of it. You want to lightly press the quinoa down to make sure everything sticks together into the cup form but not too hard that you smash the avocado. Once you fill it to the top, flip it over on a plate and lightly tap the sides while pulling it up and away from the plate. It should easily slide out by itself. I filled the opening in the avocado with my cilantro lime bean salad but you can fill it with anything you like! Then top it with hot sauce and extra cilantro. Perfecto! A spicy avocado quinoa stack is simple to make, and can be a quick healthy dinner or fancy appetizer that will impress your guests! Season the quinoa with salt & pepper. Stir in 2-3 (Depending on hot spicy you like it) Tbsp hot sauce. Cut the avocado in half, remove the pit and scoop it out of the shell. Place 1 half of the avocado flat side down into the bottom of a one cup measuring cup. Top with quinoa, lightly pressing down as you fill it all the way to the top. Level it off so it's even. Turn the cup upside down on a small plate and lightly tap the sides to help the stack easily slide out. Add 1/4 cup cilantro lime bean salad to the center of each avocado. Sprinkle hot sauce over each stack and sprinkle cilantro leaves on top. If you don’t care for quinoa, you could easily substitute brown rice, farro or einkorn wheat berries to achieve the same effect. 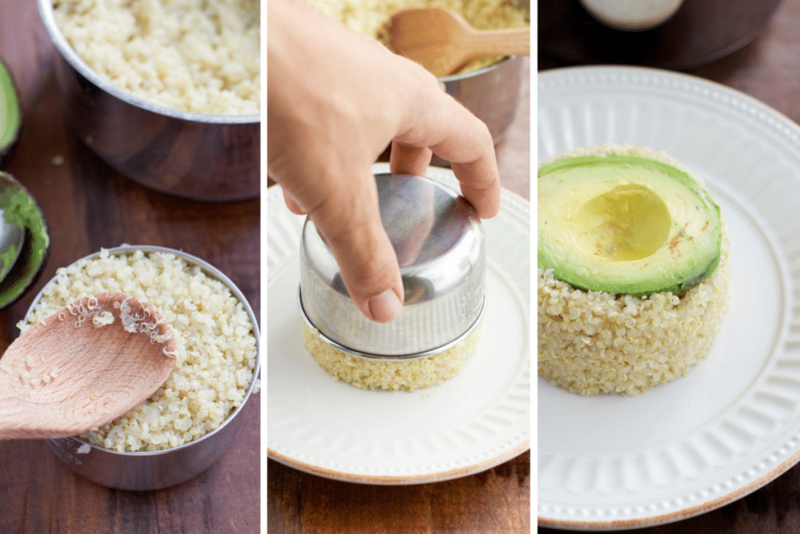 This spicy avocado quinoa stack is sure to impress your friends, family or guests! The flavors go perfectly together and it’s so simple to prepare for a quick appetizer or light dinner. If you wanted to take it a step further, you could grill or roast the avocado halves before you create the stacks. Have you ever made trimbales before? What’s your favorite stack recipe?